After a lifetime of never daring to make a doughnut recipe, I’ve now made TWO in the same week! I couldn’t resist, since they’re super easy to make and the flavor combinations are pretty much limitless. These Strawberry Lemonade Doughnuts are a great start to the day – or enjoy them for a snack or dessert later! I wanted to switch things up a bit from the Multigrain Chocolate Doughnuts I shared before, and decided that summer called for something ‘bright and fresh’. What’s one flavor that goes perfectly with that? Strawberry lemonade, of course – so I decided to give it a try. 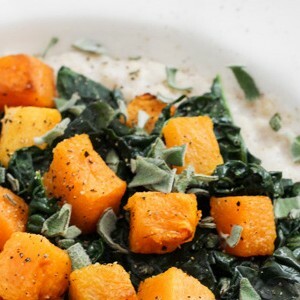 The result was not only fresh in flavor, but a wonderful pick-me-up type taste. So delicious – and still as easy to make as ever using Nestle Gerber Lil’ Bits Oatmeal Banana Strawberry Cereal from Walmart. Preheat oven to 350 Degrees F. Spray two doughnut pans, set aside. Mix all the ingredients together until well-combined. Pour into the prepared doughnut pan. Bake in the preheated oven for 10-12 minutes, or until a toothpick inserted comes out clean. Whisk all ingredients until smooth and creamy – drizzle over doughnuts. 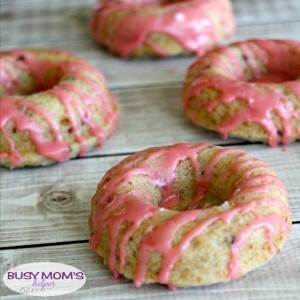 I still can’t believe how much strawberry flavor comes in that Gerber Cereal – it makes these doughnuts PERFECT! The texture is soft and moist, and once the drizzle sets it’s like a perfect balance. I think I do prefer the Multigrain Chocolate Doughnuts best – but it’s chocolate so OF COURSE! These strawberry lemonade doughnuts are a very close second, though, and go just great with a nice summer morning. Okay, so I had a REALLY hard time deciding what the proper spelling was – chocolate DOUGHNUT or chocolate DONUT. I finally decided to just go with the classic, because it looks a bit more ‘fancy’. 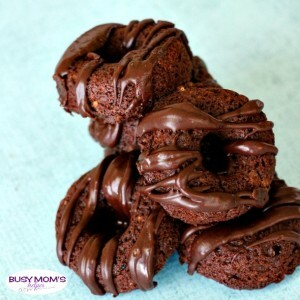 No matter how you spell it, though, these Multigrain Chocolate Doughnuts are delicious, easy to make (baked donuts, not fried) and are great for breakfast, snack or dessert anytime! If you recall earlier this week when I shared the Homemade Fruit & Yogurt Popsicles using Leftover Baby Food, I mentioned that I’d soon be sharing a fabulous doughnut recipe – well, here it is! I’ve honestly never made doughnuts before, because it was kind of intimidating – then I realized I could do a BAKED recipe instead of dealing with the frying part. Woot woot! And I even made two – so don’t miss my Strawberry Lemonade Doughnuts, as well! I love how cake-like and moist these babies are – with a lick-your-fingers good frosting drizzled for a nice finish. I may have eaten one too many – okay, a FEW too many – but it was so worth it! AND since it’s made with Nestle Gerber Multigrain Cereal from Walmart, it’s more on the healthy side. That’s a win to me! Preheat oven to 350 Degrees F. Spray a couple doughnut pans well, set aside. Mix all of the ingredients together until well-combined. Pour into the prepared doughnut pans. Whip all ingredients until smooth and creamy – the consistency should be thick but pourable. Drizzle over the doughnuts, then let set.